According to MK Yehuda Glick (Likud), U.S. Ambassador to Israel David Friedman – who is one of three lead authors of the supposedly forthcoming U.S. peace plan – told a group of settler leaders that he does not see any reason why settlements would need to be evacuated from the West Bank in a peace deal with the Palestinians. MK Glick said Friedman was “very explicit” about that point during the meeting, which was held at the U.S. Embassy in Jerusalem. Notably, the position attributed to Friedman is consistent with positions he has taken in the past, both in speaking and writing. The Embassy declined to comment on the headline-making statement or the meeting itself. Without an American statement, settler leaders are the only source for what transpired in the meeting. According to MK Glick, the small group of settler leaders pushed Ambassador Friedman to endorse an “economic peace plan” as a substitute for a political solution to the conflict. Glick said that an economic proposal would “make redundant the discourse of concessions” (under previous U.S. proposals, Israeli concessions would have included the evacuation of far flung settlements in the West Bank). 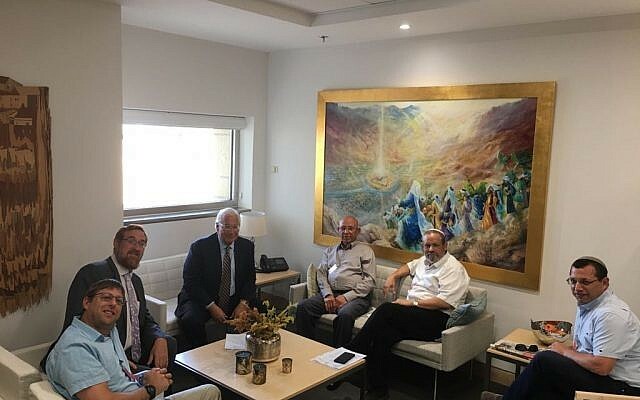 Along those lines, the group presented Ambassador Friedman with a plan for a new industrial zone and medical center in the southern West Bank that, according to Glick and Har Hevron Regional Council Chairman Yochai Damari, would employ and serve thousands of Palestinians. The plan was presented by Glick, Damari, and Palestinian businessman Muhammad Nasser, who also attended the meeting. According to Glick, the U.S. Ambassador was supportive of the plan and offered U.S. assistance once the initiative was up and running. There has been a significant uptick in East Jerusalem settlement advancements since President Trump assumed office in January 2017, reflecting the sea change in U.S. policy towards settlements (evidenced again this week by Ambassador Friedman’s remarks, detailed above). As Ir Amim details, Israel’s unrestrained advancement of settlement construction in East Jerusalem has been coupled with legislative schemes to change the borders of Jerusalem (annexing far flung settlements into Jerusalem and cutting Palestinian neighborhoods out of Jerusalem) in order to engineer a Jewish Israeli majority in Jerusalem. On August 15th, the Jerusalem Municipality signed a $380 million deal with the Israel Land Authority to finance a plethora of projects across the city, including 20,000 new apartment units. While much of this development will be in West Jerusalem, some will reportedly be in the East Jerusalem settlements of Pisgat Ze’ev, French Hill, and Atarot. 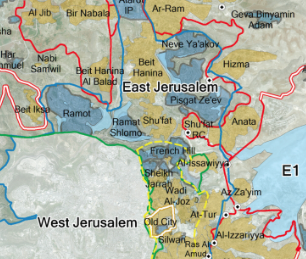 The Jerusalem City Council is expected to give final approval to the plan next week. According to The Jerusalem Post, on August 12th the Israeli government approved a plan that will triple the size of an industrial zone in the Kiryat Arba settlement in Hebron, approving 10 million shekels for the project. 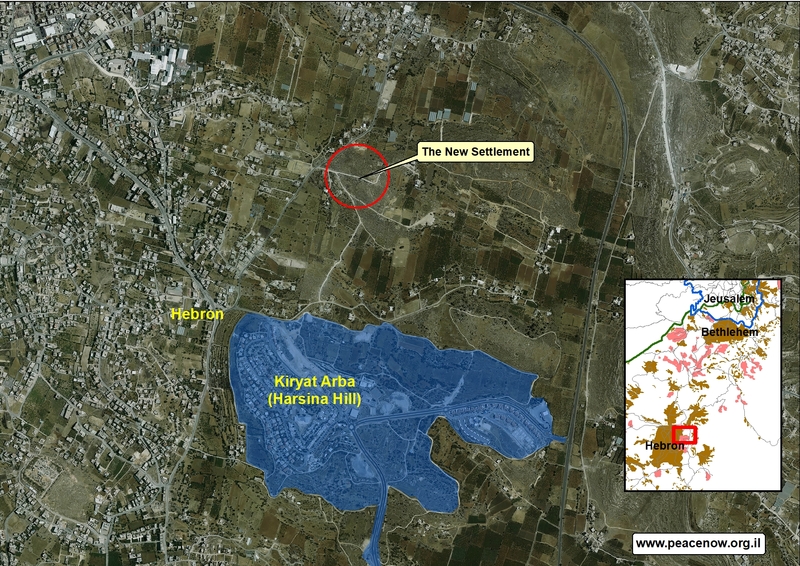 FMEP reported on the initial plans to build the Kiryat Arba industrial zone in March 2018, noting that the industrial zone is technically within the borders of the settlement but well outside of the developed lines of the settlement and beyond the fence that surrounds it – making it, in effect, a new Israeli settlement in Hebron. Now, the new settlement is set to significantly expand in one of the most volatile areas in the West Bank. The creation (via military order) of a new autonomous committee to represent and service a cluster of settlers living in enclaves in Hebron’s city center is being challenged by the Hebron Municipality. In response to the Palestinian petition, the High Court of Justice put a freeze on the plan, effective July 4, 2018, and gave the Israeli government 120 days to explain the legality of the plan. The petition argued that the military order creating the new body was intentionally vague in defining its legal and geographical jurisdiction, and pointed out that the new committee would be able to override decisions by the Hebron Municipality thereby stripping Palestinians of autonomy and representation in matters that directly affect them. It is unclear from reporting if the Knesset Finance Committee’s decision to fund the new committee is related to the High Court’s ongoing consideration of the case. However, what is clear is that the Knesset is not concerned about undermining the High Court of Justice’s power over West Bank issues — indeed, the Knesset is actively pursuing that end with the recent passage of a new law stripping the Court of jurisdiction over land disputes and transferring it to a domestic Israeli Court, and with ongoing consideration of a bill that would allow the Knesset to reinstate laws that the High Court strikes down. On August 12th, the Knesset Finance Committee approved the transfer of $9.5 million to pay contractors for their ongoing work on the first new settlement built with government approval in 25 years, Amichai, and a new “temporary” outpost for settlers whose homes were built on privately owned Palestinian land in the Netiv Ha’avot outpost and were recently demolished. Amichai is the new settlement approved as a pay-off to the settlers who were evacuated from the illegal Amona outpost. Construction on Amichai has begun, but has been interrupted several times due to lack of government cash, a problem ostensibly solved by this week’s cash transfer. With respect to the new outpost for the Netiv Ha’avot outpost settlers, in February 2017 the Israeli government approved an unusual plan to place 15 mobile homes — connected to Israeli water, power, sewage, roads, and other infrastructure — at a site located near, but not within, the borders of the Alon Shvut settlement, in effect creating a new outpost for settlers evacuated from another outpost. When the High Planning Council initially approved the advancement of this plan in October 2017, it noted that “the plan is improper, but we will have to approve it as a temporary solution.” At the time, the Council ordered the government to go about expanding the borders of the Alon Shvut settlement to include the land. Under the approved plan, the new homes will be allowed to stay in that location for three years. However, based on past practice, it can be expected that within that time, or at the end of those three years, the site will “regulated” by Israel to become a permanent area of Israeli settlement. In both cases – the Amichai plan and the Netiv Ha’avot plan – the Israeli government massively “compensating” citizens for the inconvenience of having been caught brazenly breaking Israeli law (i.e., for building without permits on privately owned Palestinian land). The two cases highlight the way in which the Israeli government not only encourages illegal settlement building, but generously incentivizes and rewards its. At this point, in addition to two new settlements, approximately 20 million shekels ($5.4 million) has been paid to the Amona evacuees and 15 million shekels ($4 million) to the Netiv Ha’avot evacuees. A dispute between Israeli government agencies has led to a delay in the opening of a new Jerusalem tourist site – a park established for the express purpose of taking control over the Ein Al-Hanya spring, which was historically part of the al-Walajah Palestinian village. Originally slated to open April 1st, the delay centers around a battle over who will fund the operations of the site. For now, the site is closed and the grounds are not being maintained. Regardless of the dispute, Israel has implemented policies that prevent Palestinians from accessing the spring and surrounding lands, including illegally moving a police checkpoint to further choke off al-Walajah from Jerusalem. As detailed in Haaretz, the plan for the park includes three pools filled by the spring – two for Israelis and tourists, and one for al-Walajah residents to water their crops and flocks. However, that third pool for Palestinians has not been built, and the water “merely spills into the nearby wadi.” The other pools, like the park, are currently empty and fenced off. Haaretz reports that settlers have forcibly evicted a Palestinian family from their home near Bethlehem, in defiance of an Israeli court order. The Palestinian Samara family reports that settlers tricked them into leaving the property, after which settlers locked them out, forcibly evicted them and their belongings, and then used a bulldozer to demolish their home. The family has filed an appeal to the High Court of Justice. As Haaretz notes, there does not appear to be a different or new judicial order that would change the 2016 agreement. In 2017, the Samaras reported that a new settler family had moved into the compound and began harassing the family members who remained – prompting them to file a complaint on July 26, 2018 with the Israeli police in the Beitar Illit settlement. Two weeks later on August 6th, the family was forcibly evicted and their units were demolished. Despite the Samara’s harassment complaint and a real-time call to the police while the eviction was taking place, Israeli police took no action to prevent settlers from evicting the Samaras, reportedly stealing their cellphones, and bulldozing the properties. The Beitar Illit police station even refuse to allow the Samara family to enter the station and file a complaint until a lawyer for the family got involved many hours later. Following intervention by UNRWA, the family was allowed to return to search the site for their ID cards and other important belongings. Now homeless, the Samara are taking their case to Israel’s the High Court of Justice.